AAAAAAAAAAND drumroll please, it's the number 1 card! Star-Vader, Omega Glendios! So what can I say about this card? Tell you what, I'll be nice and give you my revised opinion of this thing as if it were new, just to showcase what I really feel about it! Well, that's what the second skill is for. By tossing a Reverse unit from the hand and Counterblasting 1, the opponent's units don't unlock on their next turn, but the turn after. 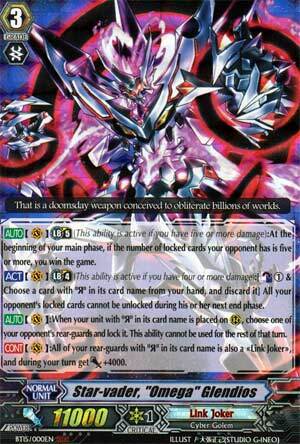 So the idea is you lock their cards one by one, toss Reverse units, then use the UB to win. In theory. Unfortunately, the requirements to even pull this off at all are so technical and so reliant on chance it is basically not feasible as a main gambit at all. The Ultimate Break is automatically a bust since the gambit couldn't telegraph itself any harder when you ride it, and because a Critical will damn you to an instant loss most of the time, it is difficult to even reach 5 damage while having 5 locked at the same time. ...and that's where my blatantly copy-pasted review ends because that's the only part that stayed the same. It's still a stupid gambit that should never be attempted competitively. Third skill: Lock a unit when you call a Reverse unit once a turn. That's a good way to shut down a column, and not being restricted to Late Game is really nice. Forth and final skill is that Reverse rear-guards become Link Joker and gain 4k during your turn. Well, that's neat, combined with a 6k booster they reach 21k, enough to force 15k guard against most opponents. What's especially neat is that it's live from turn 3, so it's a good way to inflict damage. I wasn't impressed by this card at first because it sounded so flawed on paper. Shows what I know, it was only when I read the rulings on the support he got that I realized he was actually a really good beatdown deck. The columns made by the Reverse units ensured big guard forcing, and the locking gave it staying power. And it only got more since I found out that Taboo Star-Vader seals any units whos skill includes the words "at the end of the battle that this unit attacked a Vanguard". Because it finished as a battle on a REAR-GUARD. This was an incredible way to render a scary ace vanilla for a turn and buy time. Seriously, who didn't see this one coming? ...Okay, maybe a lot of you. But let's run down why this card is right where it should be (though I would have had CEO Yggy as #1, but that's just me). Alternate win condition? Own support within the set? Personal perfect guard that makes STD cry in the corner with Vermillion? One of the very few cards from the pre-legion era still topping against Legions? Check yes to all of those questions. While getting the World's End off isn't something that happens much, if at all, the fact that this Anti-Spiral look-a-like world destroyer can stop your field cold and keep you from doing anything for turns on end is just so good. Plus the Omega Lock is so annoyingly good that Bushiroad decided that several Link Joker cards in set 17 get to have it as well. So, that's all for the top 10 list this year, folks! ...Okay, I'll give you one more top 10 list. My personal top 10 break rides. Three of them have two crossrides even!